Comprising a lacquered bronze star, the uppermost star took the form of the imperial crown. A pair of crossed swords (topped by an oak leaf) featured on the obverse of the medal. An inscription upon the star bore the legend Aug-Nov 1914. The reverse of the medal carried the recipient's number, rank, name and unit. A Bar was instituted by King George on 19 October 1919 in recognition of men who "actually served under fire of the enemy" between the specified dates. The Bar bore the inscription 15 Aug to 22 Nov 1914. Holders of the 1914 Star were not entitled to the subsequent 1914-15 star. Similar to the 1914 Star but for men who went on active service between 23rd November 1914 and 31st December, 1915. 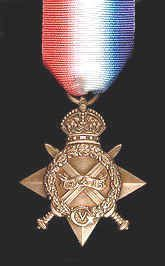 Dependant on his period of service, a serviceman would normally have two or three of these medals awarded to him. Gallantry Awards are covered elsewhere. If a soldier entered a theatre of war after 1st January 1916 he would only be entitled to the British War Medal and the Victory Medal. He was not eligible for a Star as these were discontinued after 1915. 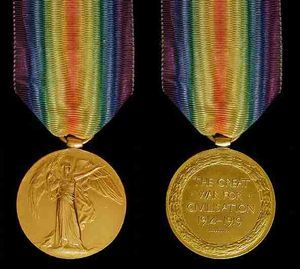 The list below shows the order of precedence for World War One medals. Worn on the right sleeve. His Majesty the King has been graciously please to approve of the award of chevron to denote service overseas since the 4th of Agust ,1914. 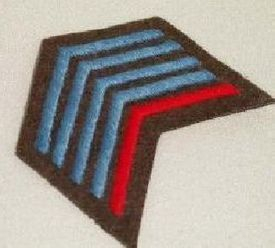 Chevrons of two colours have been approved. 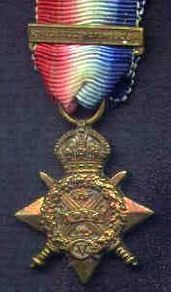 The first chevron if earned on or before 31st December 1914 , will be red, if earned on or after 1st January ,1915 it will be blue, and all additional chevrons after the first will be blue. Worn vertically on the left cuff they were issued after a man was wounded, including gassing, but not for accidental injury. In theory there was no limit to the number a man could have, however his luck is liable to run out before the brass they were made of.